In less than a week, Milton turns one-years-old! It is hard to believe. When Milt dog was a young pup, he was always the first to rough and tumble with another dog no matter how big or small the other guy was! I loved how wild Milton was about other canines and how he was just so darn social. Growing up as a supreme introvert with a small circle of close friends, I was absolutely thrilled that our dog was an extrovert! I really think in life, you have an easier go with it if you can be at ease in the presence of anyone. It is quite the gift to be born with or skill to develop in later years. 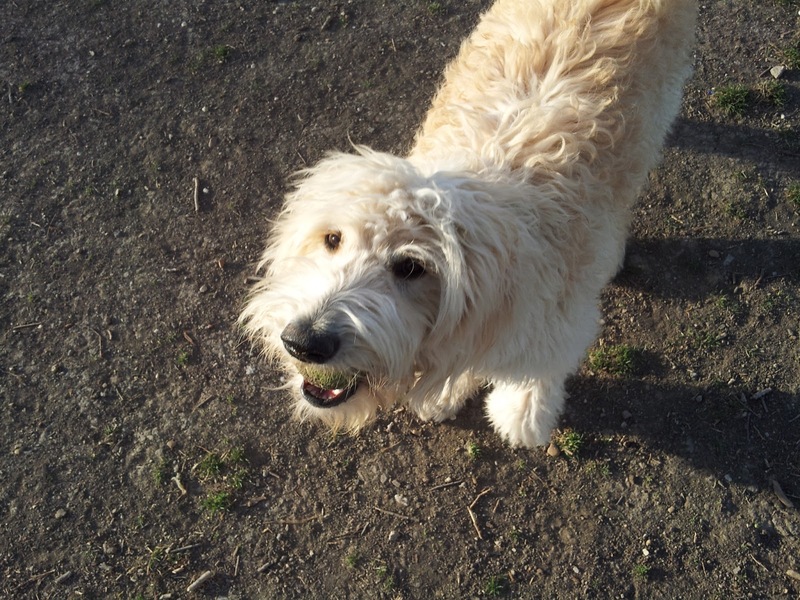 Our goldendoodle was born a supreme charmer of both two-legged and four-legged creatures. Unfortunately, our dog is becoming more antisocial on a daily basis due to one major reason...! First of all, on work days when he stays home, I always take the Milt to the local dog park in the afternoon. I used to take him for another long walk, but those twice a day walks were tiring me out but not him! Rather, a solid two hours at the park can wear the dog out for the remainder of the evening. Milt dog used to play around with all of his buddies there - frolicking and cavorting about with a heavy heap of wrestling, biting, and tumbling thrown into the mix. He loved to meet, sniff, and greet every single dog that walked into the park. He was Mr. Charisma. Now the Milt dog just has one focus in life - ball. Milt lives to play ball - throw, fetch, and throw again. It is his passion; retrieval is his new found hobby. When the other guys run up to play, Milt dashes and dodges. It is like he thinks he is in training for the Doggie Olympics. He just wants to run his bouncy ball back to the thrower. Not only has our dog turned introverted, but I can no longer leisurely read a good book while kicking back at the dog park. I need to be out there hurling that ball; the embarrassing bit is if Milton gets distracted by some other ball play, or I am not quick enough to get the ball from him, he will go to someone else to fulfill his need. Oftentimes, when I am attempting to read a book or make a phone call, Milton will just waltz on over to someone else for a throw. It certainly makes me look like a bad doggie parent, but I think any of us who attend the dog park on a regular basis (and there is a definite crew!) is more than willing to help out a fellow pup in need. It just makes me look like a bad parent! Milt likes to cool off his ball (oftentimes his feet too!) 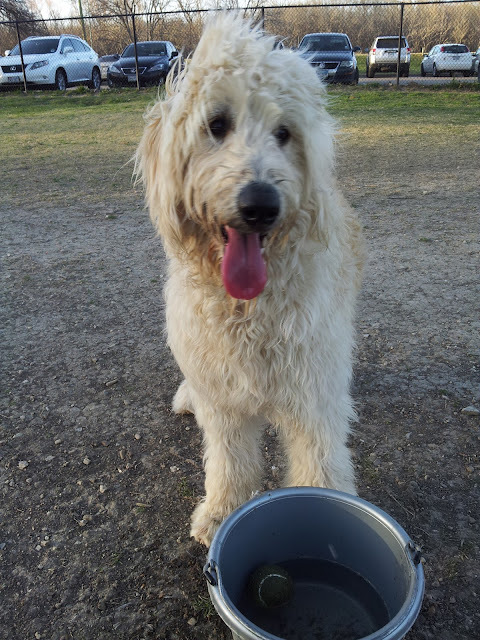 in the communal water bowls...! Why am I writing about this on the week leading up to Milton's first birthday bash? Well, we plan to have an exorbitant amount of tennis balls available for play, so I am just hoping that he interacts with all of his little friends instead of getting sidetracked by his real calling in life - fetch. Every guy needs a day off from serious training, so hopefully Milt dog will take advantage of that on his big day! Great post! It looks like Milt had a great time. So many pictures from Thuy.